Evelyn Ewere aspires to achieve a sustainable economy in her home country Nigeria. The DAAD scholarship holder is researching bio-economic alternatives to fossil resources, oil in particular, at the Right Livelihood College in Bonn. She is receiving prominent support – from Alternative Nobel Laureate Nnimmo Bassey. When Evelyn Ewere saw the call for applications for the doctoral scholarship, she was electrified. “That was exactly the topic I wanted to write about”, she recalls: “Bio-economic transition in Nigeria”. Her home country is currently Africa’s largest oil producer and dependent on the fossil fuel, which also destroys the environment and the livelihoods of its inhabitants. Evelyn Ewere knows exactly what this means. She grew up in the Niger Delta, a region where oil is pumped from numerous bore wells. Not only did the focus of the scholarship inspire her, she was also enthusiastic about the announcement that the recipient would be working with environmental activist Nnimmo Bassey at the Livelihood College (RLC) in Bonn. The Nigerian has been committed to sustainable economic development in his country for many years. In 2010, he received the Right Livelihood Award for his commitment and his efforts to demonstrate the consequences of oil production . Evelyn Ewere’s dream came true. 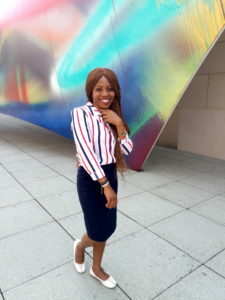 After completing her studies in agricultural economics in Nigeria, she received a DAAD doctoral scholarship at the Right Livelihood College, which is located at the Centre for Development Research (ZEF) at the University of Bonn. Each year a scholarship funded through resources from the Federal Ministry for Economic Cooperation and Development (BMZ) is awarded. The young scientist is one of five Ph.D. scholarship holders from developing and emerging countries who are currently working at the RLC campus and have the opportunity to collaborate with alternative Nobel Prize winners. Evelyn Ewere wants to investigate how engaging in bio-economic activity, specifically recycling and power generation from biomass power plants, affects land use and food security. Through her work she wants to make it clear that there are better alternatives for Nigeria. The doctoral student came to Bonn in October 2017. The connection to the DAAD and the ZEF creates ideal research opportunities. “I am very well looked after”, she says, and what’s more “I feel welcome and appreciate the international community”. As a Ph.D. scholarship holder Evelyn Ewere receives funding from the DAAD for three years. She has ambitious plans for the time afterwards – she will present the results of her doctoral dissertation in Nigeria and promote the transformation of the oil country into a nation with a sustainable economy.